With the fall of the ninth wicket in Sri Lanka's second innings in the form of Kasun Rajitha in their encounter against South Africa, a sense of desperation and hopelessness wreathed the team. The impending fear of bearing witness to a yet another patterned defeat, clouded the beliefs of the die-hard Lankan fans. Well, who could have blamed them? The last wicket batting pair had a mammoth task of scoring 78 more runs ahead of them. But Kusal Perera's calculative approach to the chase coupled with Vishwa Fernando's stern defiance to support his team-mate laid the foundation for a victory that comes but once in ages. Perera was at his hitting best, compiling 153 off just 200 balls, his innings laced with 12 fours and 5 sixes. He looked adept at dealing with a variety of deliveries from the SA bowling attack. Be it cutting and slicing at a delivery from Dale Steyn, or reverse sweeping Keshav Maharaj for a boundary, or pulling Kagiso Rabada at will, Perera was dispatching deliveries for boundaries left and right with nonchalance. It is therefore inevitable that we discuss the context in which this knock was played. Sri Lanka had lost their previous Test series away vs Australia 2-0, and they had lost 6 of their last 7 matches. The team looked like a shadow of their former selves ever since the retirement of the experienced duo of Kumar Sangakkara and Mahela Jayawardene. But going into the series against South Africa, the Sri Lankans had nothing to lose. That gave them a positive mindset, a renewed outlook, and a solemn resolve, instilling a sense of hope in the Lankan dugout. The last wicket match-winning stand was the cumulative outcome of the players' brilliance and the fans' prayers. Going 1-0 up in the series has given Sri Lanka the much-needed momentum. Sure, the uncertainty of the future is an enigma for all, known only to the few who are regulars at the Oracle. But it is time for Sri Lanka to bask in the glory of their historical feat etched in cricketing folklore. When you see the score of 153 though, it is impossible to not think about arguably the greatest left-handed batsman of all time, the one and only Brian Lara. 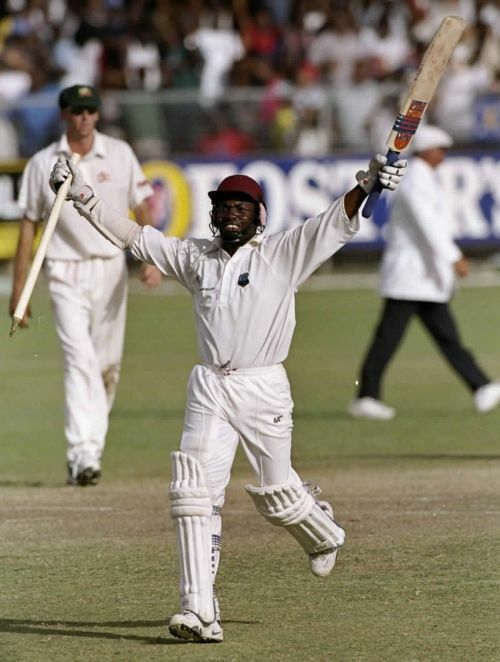 Although Lara broke numerous records over the course of his decorated career, there is one particular innings that stands out purely for the circumstances under which it was played. His 153 not out against Australia at Bridgetown in 1999 momentarily stalled the Australian Test cricket dominance that was set to become a norm in the decade that followed. The Prince of Trinidad was touted as a pioneer in West Indies cricket, capable of reclaiming their lost pride and leading the team to World Cup glory. His biggest assets were his high backlift, excellent hand-eye coordination, clean striking ability, and unmatched timing. But he often had his task out while stitching match-winning partnerships, as his teammates were nowhere close to his class. Australia's tour of West Indies in 1999 gave the world a glimpse of persistently defiant batting in the form of Lara. Before this series, West Indies had a dismal tour to South Africa when the Proteas took home the series 5-0, clean sweeping the Men from the Caribbean. And then in the first match against the Aussies they lost by a whopping 176 runs to crush their morale even further. The second Test was a chance for a new beginning for the home side. Replying to Australia's 256, WI had a nightmarish start to their first innings, losing 5 wickets for just 56 runs. Lara then stepped up and combined forces with Jimmy Adams to add 322 runs for the 6th wicket. Lara eventually finished on 213 while Adams fell 6 runs short of a well deserved century. WI were rightly the winners in this one-sided encounter. Unfortunately for the home side though, a dominant showing in the second Test did not inspire a repeat performance. Australia batting first after winning the toss scored a humongous 490 in their first innings, thanks largely to Steve Waugh's 199 and Ricky Ponting's 104. For the West Indies, the nervous start was somewhat compensated for by Sherwin Campbell's century and a half-century from Ridley Jacobs. A mediocre 146 from the Aussies in the second innings meant that WI had to score 308 runs for victory. A good opening partnership of 72 was followed by a batting collapse, leaving the WI gasping for breath at 105/5. Jimmy Adams walked out to bat in the company of Lara. The latter had survived a few close calls and was still looking to find the perfect balance. Defensive prods, backfoot punches, and front foot lofted hits got the Prince going, giving the crowds something to cheer for. Adams essayed the role of the second fiddle with poise and patience, which annoyed the Aussies. Glenn McGrath ended what looked a like a partnership that would seal the match for the WI. Soon the score went from 238/6 to 302/9. Now that Courtney Walsh was out in the middle, the Aussies believed the match was all but over for the WI. But Walsh's incessant struggle helped him survive a thrilling over from McGrath. In the end, a cover drive from Lara sealed the game. The above two instances are classic examples of indomitable spirit reigning supreme against all odds. Both the innings came in a potential losing cause. Both the innings came against top quality sides. Both batsmen performed for teams that were coming in on the back of poor records in Test cricket. Who knows if another 153 not out against a top quality side in unfavorable circumstances will again make its entry into the cricketing folklore. You 'never say never' in cricket.